I just returned to Los Angeles from a month of travel. What should have been 3 separate trips turned into one long, hazy mess that included too many shared rides, buses, trains, ferries and flights to count. I did make it back to LA for 12 hours to unpack, do laundry, repack and sleep for a moment in between trips 1 and 2 and a whole 36 hours between trips 2 and 3. If it wasn’t for the need to pick up some gear from my home, I probably would have rented a room close to the airport for the night. All that said, from my highly curated Instagram feed, it would look like I was having the time of my life, sleeping in and lounging the days away! In actuality I was running on little sleep and even found myself having a dinner of Cheetos and a string cheese in my yurt in the dark one night... and that wasn't even my low (I'll get to that later). Having a wedding photography business does give me the luxury of planning out my year to some extent, defining weekends up to a year in advance. 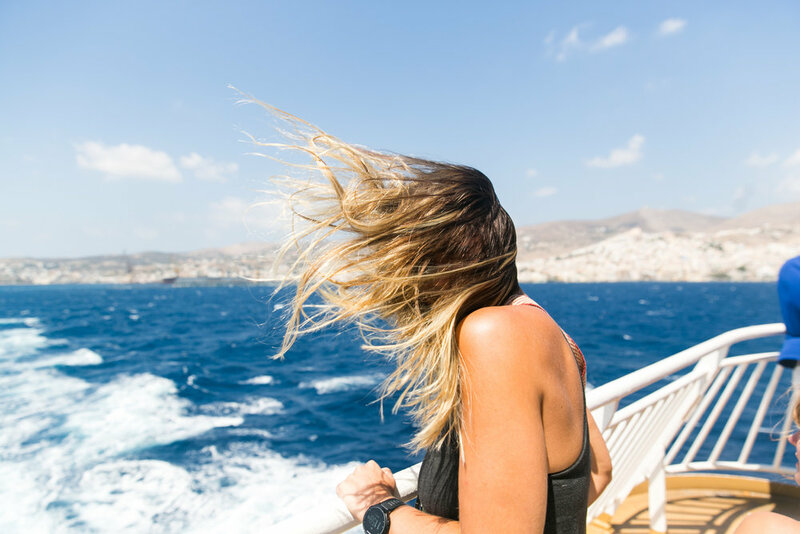 However, there is a drawback in that you can’t rearrange your schedule if other things pop up - such as a cousin deciding to have a wedding in Greece just a couple of months before. The same thing can be true about music festivals (another bread and butter) as these dates are also set in stone. This is what shaped my month long journey - two weeks in Greece for my cousins wedding / exploring some Greek islands, one week at a music festival, and one week shooting a wedding in Hawaii. First stop: Greece. The beginning of this leg was spent enjoying time with family, checking out our apartment in Athens that needs a ton of work but has future potential as a haven in Europe in the coming years, and attending my cousin Tania’s second wedding in Greece and the baptisms of her two children. Tania married her husband 10 years ago at City Hall in New York City and me and my immediate family were present. This was different though - this was a GREEK WEDDING in a beautiful Greek Church followed by a reception at the Divani Apollon Palace. I was hoping for more oversized Greek statues at the latter but it was actually beautiful and cuddled up to a cove overlooking the Aegean. I took a bunch of photos that day (along with an entourage of about 10 other photo/video people - not joking) and edited them quickly as my family always complains that I take too long. This is always followed by me explaining that client work comes first. My sister and I discussed parting ways with the parents and exploring some Greek islands on our own for the next week. My friend Molly happened to have a break from a job in Romania before a wedding in Poland, so she joined in on the adventure too. As much as my heart was in search of quaint fishing villages untouched by time, we found ourselves mainly in bustling port cities, avoiding tourist traps left and right and searching for any glimmer of authenticity we could see or eat. This was mainly because we tried to pack WAY too much into the week we had. In hindsight, I would have picked one or maybe two islands. We visited Syros first which was the exception. Thanks to Molly doing research before our trip, we stayed in an area above the main port known as Ano Syros. There were two places for a taxi to drop off visitors as cars cannot maneuver the tight labyrinth of walking streets built to ward off pirates in ancient times. We stayed in the home of Markos Vamvakaris, the “patriarch of the rebetiko” (a specific genre of music). I can’t really put into words the uniqueness of this place but it really had a magic about it. We would wake up to the bells of goats across the way, bougainvillea would fly into my separate bedroom from the farm door entrance, and there were grapes growing on the trellis by the entrance to the main house. On Syros, we found markets that only sold cheese, markets that only sold bread items and markets that only sold fruit - not uncommon in Europe but far from what we experience in the US. 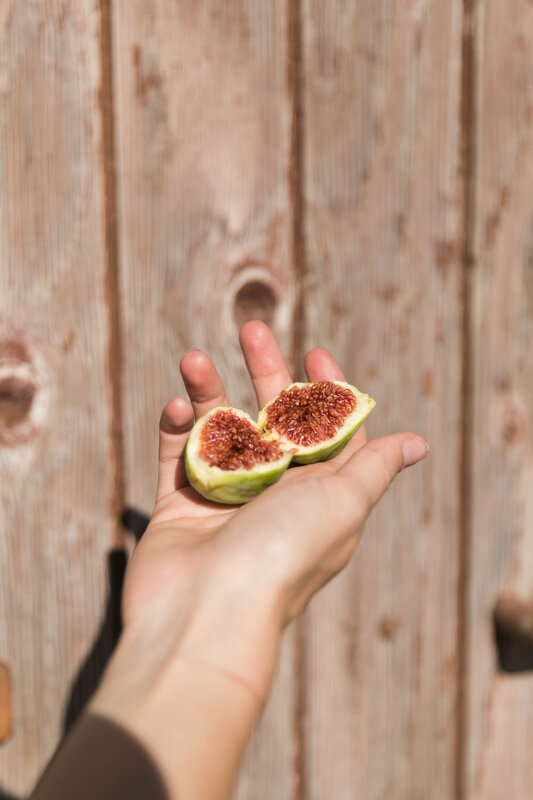 We also found wild fig trees EVERYWHERE with beautiful, ripe offerings from which we took, and took and took. 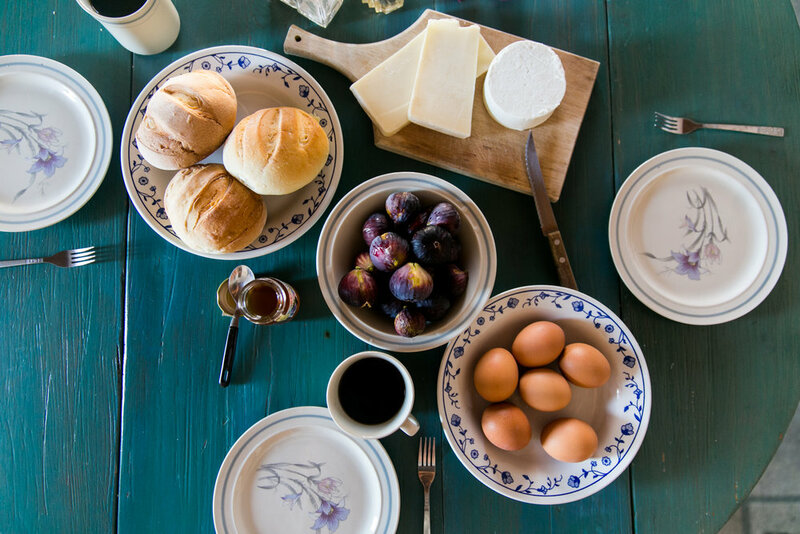 My favorite breakfast in Greece was in that home with local cheeses, honey, bread, hard boiled eggs and fresh figs. 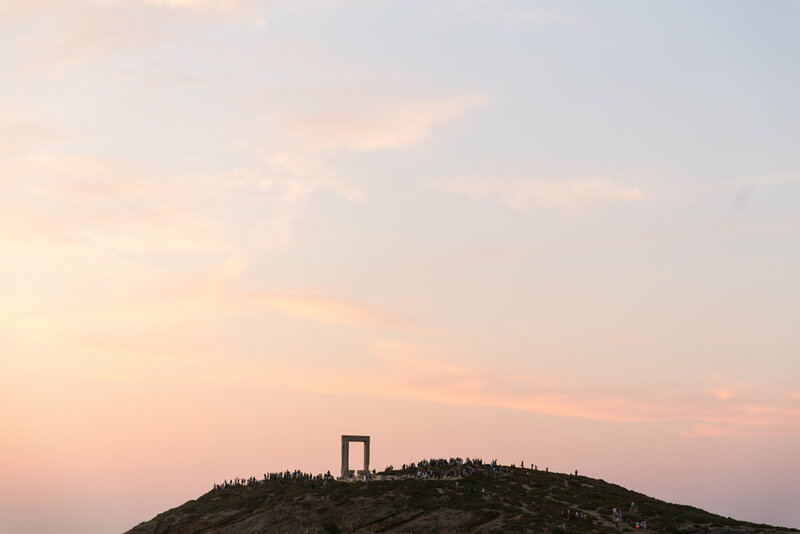 The second island was Mykonos and I think we all experienced a culture shock that we expected but far surpassed what I imagined. 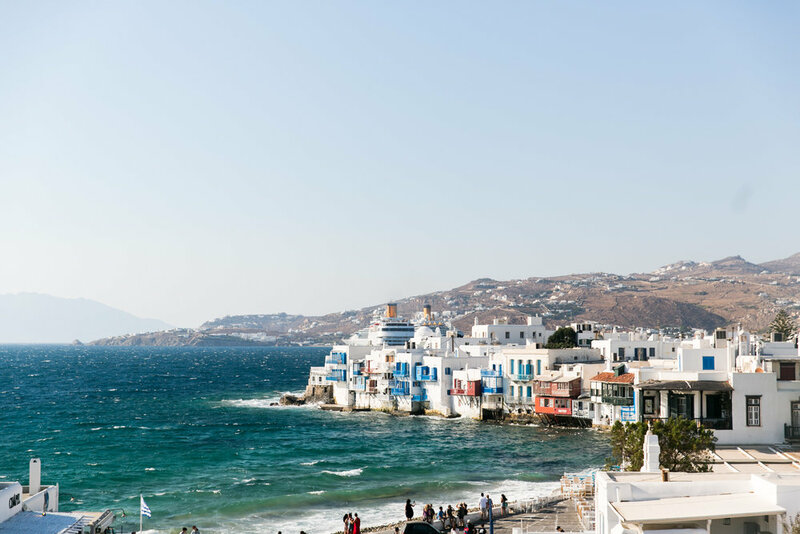 It’s probably anyone else’s experience with Mykonos if they go there and embrace what Mykonos is about. Clubbing and dancing, dancing and drinking, drinking and clubbing. It truly is the city that NEVER sleeps. We were scolded from going home from the club at 4:30am by the bus driver but we had first pick of pastries from the bakery. I rarely ever go to bed when the sun is coming up and I would never think I could muster up enough energy to get up a few hours later and go back to that same beach and dance some more. But I can say I’ve done Mykonos and I’m good and I’m alive. So there’s that. 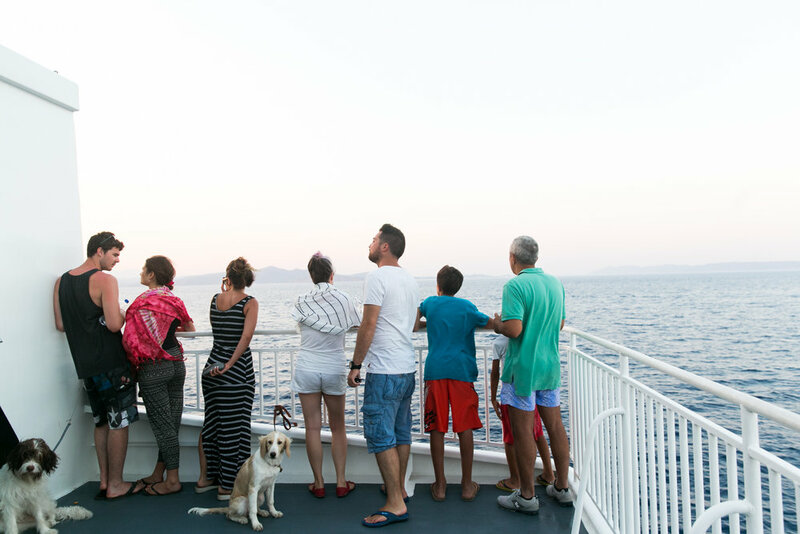 Molly left us in Mykonos to head to Turkey for her own new adventures and my sister and I headed to our last island, Naxos. I think this could have been my favorite island but I was just too frickin' tired to really take it in. There were nice restaurants, pretty sites and lovely beaches - what more can you ask for? Oh yeah and our favorite Airbnb host that fed us dried figs, his mom’s orange bread, and Greek coffee in the morning. On the ferry back to Athens, my sister and I had a FEAST of local delicacies much to the jealousy of our ferry neighbors. These are my images and words from travel, home, work, and play.